Hi! I've got a bit to catch up on because I haven't shown you last week's Sew Weekly creation yet! 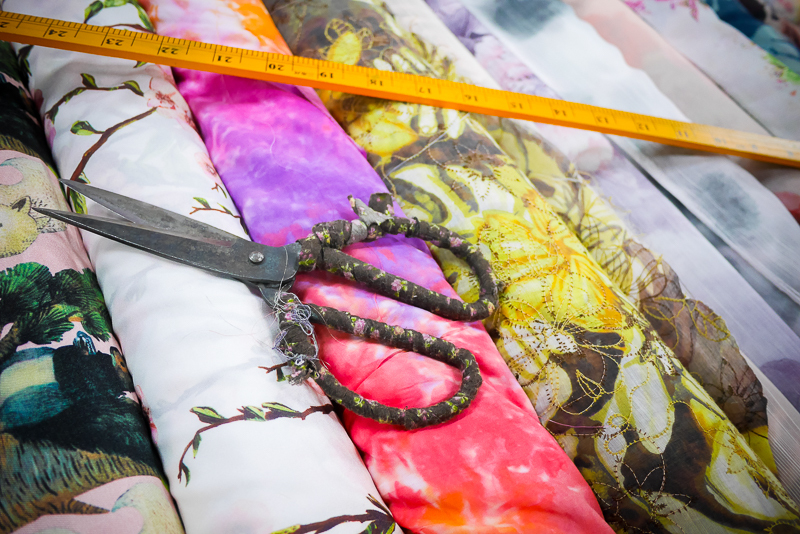 It was inspired by Lilly Pulitzer, an American designer, who I google imaged searched like crazy last week, and found her fabric choices to be very nostalgic and not unlike vintage bedsheets, vintage tablecloths or vintage ... curtains. 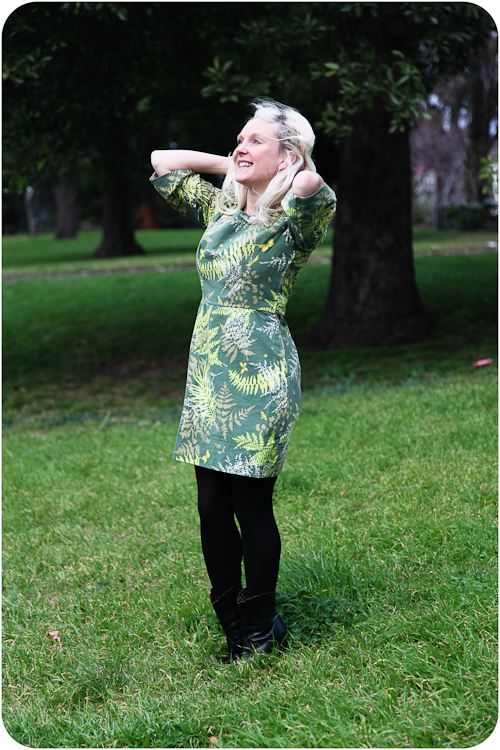 Which seemed to suit my style a bit, especially since my lovely Pulitzer Fern dress today, is made from 1 x 1 (x 2 of course!) metre curtains (bought from the op shop still with the plastic hoops attached). You could say I'm a little happy about winning my Pulitzer Prize. LOL. It's funny seeing these photos as I've visited the Hairdresser for my update since then, and I've already forgotten how dark my hair is along the roots. I've been asked before, but my natural hair colour is very light mouse-y blonde, and I'm perfectly in love with the platinum here. My hairdresser is Corrin, of Corrin's Hair Lounge in Brunswick (MELBS) and she's also a total darling and I bet if you dropped in you'd marvel at her vintage-esque hair lounge, and her darling handmade pieces around the store. YES, she's a crafty queen as well. So, another 'How I styled it' photo for you, because it is a little cold here in Melbs and there's no way in hell I'd walk anywhere without a jacket! 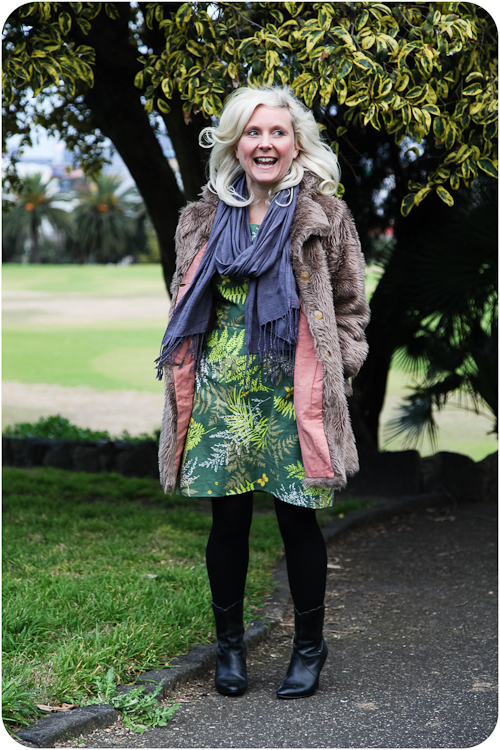 My super smiles in the above photos are actually "I'm totes freezing, quick with the photos Husbie!". This week currently at Sew Weekly, we're making musical outfits: creations inspired by album covers! I just ADORE Mena's White Stripes influenced romper! Had to laugh when I saw the fur coat. I was thinking nice dress but she must be freezing! green is a great colour on you! love the dress! This dress is fabulous!! 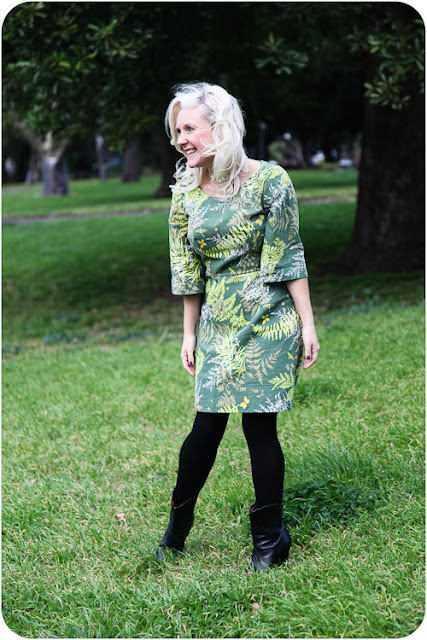 Love the sleeve shape, and of course the great fern print! This is such a beautiful dress - wonderful project. Your huband took such pretty pictures of you! Look at you all rugged up in that last photo! It must be freezing down in Melbs especially considering how cold it is here on the Goldie. Gorgeous dress! Love the green on you. 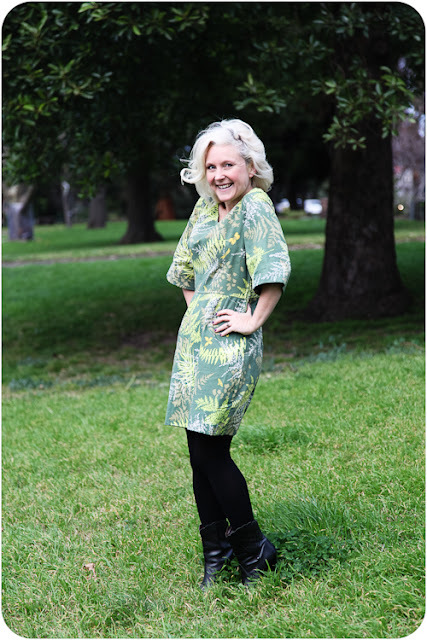 You find the best fabrics, LOVE the dress and your photos. My god it's cold but it never shows in your piccy's. Great coat. Have a great weekend. Did you use a pattern? I love the sleeve shape too! !